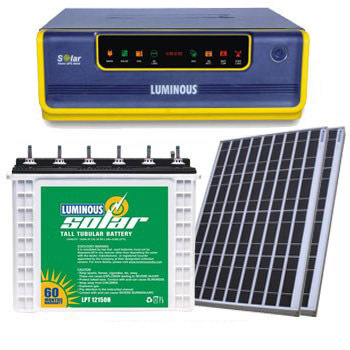 Luminous Solar 850 Combo is designed to give power supply for 4-5 hours to 2-3 BHK homes in India having severe power cuts and unreliable electricity supply. It is a Small Power plant which can run a Peak Load upto 650 Watts. If you are leaving in a City or where Electricity is available and Power cuts are frequent, The Solar Combo helps you to save Electricity of almost 1.5 Units per day which is used in battery charging.